Identification: This species has a nearly transparent body decorated with opaque white on the cerata tips, rhinophore tips, cephalic tentacles and notum. The bases of the rhinophores are pale orange and the tips of the cerata may have a faint peach tinge. The branches of the digestive gland in the cerata are strait to weakly spiral without side branches and the tips of the cerata and rhinophores may appear slightly wrinkled when partially contracted. It may be distinguished from the similar appearing Caloria sp. #2 by the more sharply margined white patches on the notum and the white rhinophore tips. Taxonomic notes: First recorded in Hawaii from Hekili Point, Maui by CP on June 9, 1991. 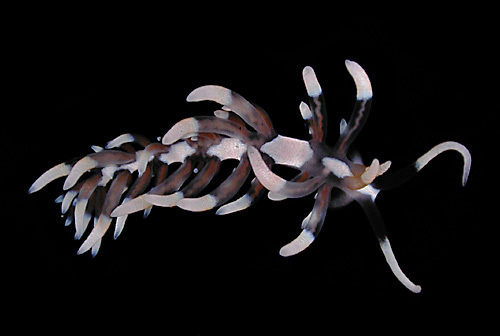 Photo: PF: 10 mm: found by CP; Hekili Point, Maui; June 9, 1991. Note 1: Although it hasn't been confirmed by observation, the habitat of this species suggests that it may feed on the octocoral Sarcothelia edmondsoni.